If youre wanting to learn how to properly adapt etiquette into your wedding...Then this may be the most important letter youll ever read! Youre About To Learn The Secrets To Properly Adapt Etiquette Into Your Wedding, No Matter How Much Time You Have Had To Prepare! It doesnt matter if youve never experienced a wedding with etiquette, This guide will tell you everything you need to know, without spending too much brainpower! Theres finally a new, breakthrough book created just for people like you! I myself have been a wedding planner for 15 years , but it wasnt easy my first two times! I mean, information on this is pretty hard to come cross. Especially the kind of information I wanted to know more about. To be quite honest with you, I got tired of looking and searching all over the place, so I decided to create the definitive book on wedding etiquettes! This Isnt Like Any Other General or Generic Book On Wedding Etiquettes You Can Find In Any Store.. This book covers everything there is to know about wedding etiquettes . In fact, some people have called it the Wedding Etiquette Manual ! Its like having your very own etiquette expert that you can reference and ask questions anytime that you need to! Youll uncover a wide array of tips including interesting facts that made them what they are today! Youre going to discover so many things on how to adapt etiquette into your wedding with little effort! Not only will you Learn all the different things you should include in the invitations, but youll also learn extra bonus tips to actually teach people. ·	How to properly determine whos doing what. ·	Discover how to handle invitations and announcements. ·	The wedding etiquette breakdown of whos who. ·	Learn the several key elements to remember for the wedding shower. ·	A step by step guideline of what normal wedding showers include. ·	Discover the etiquette friendly ways of writing wedding invitations. ·	Learn all the different things you should include in the invitations. ·	Discover what else goes in the wedding invitations. ·	When and when not to accept gifts during your shower. ·	What types of gifts you should give to guests at your wedding. ·	The gift dos and donts list to follow for your etiquette. ·	Learn how to nicely return a wedding gift. 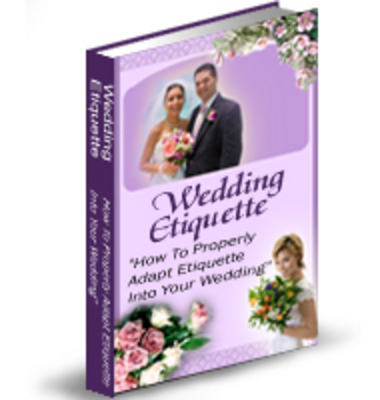 ·	Wedding etiquette tips guidelines for your etiquette. ·	Find out who to tip, for which services & how much. ·	Plus much MUCH More!